Once a year, on a Tuesday night shortly before Christmas, our bead group has a party. It’s fairly constrained, not in the least bit wild, the kind of event that feels just right. 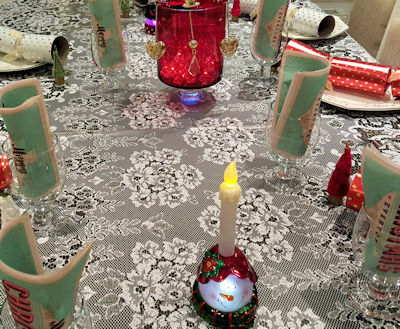 We sit in a circle together every Tuesday all year ’round, but on this one night, the table is decorated, food is ordered in, and we just talk. And eat. And laugh and sometimes cry. It’s the night when we acknowledge that we are far more to each other than just fellow crafters and artists.